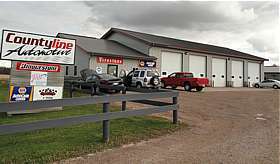 "Dorchester WI Auto Repair and Towing Facility"
Countyline Automotive is family owned and operated since 1992. 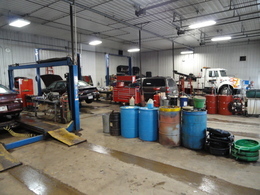 We are your one stop auto service shop offering auto repair, motorhome repair, towing service, tire dealer, and used car dealer all in one convenient location on the north side of Dorchester, Wisconsin. We are conveniently located halfway between Abbotsford WI and Medford WI at the intersection of Highway 13 and Countyline Road. Our full service auto repair business borders Marathon, Taylor, and Clark counties in north central Wisconsin.We are only 6 miles north of four lane Highway 29. 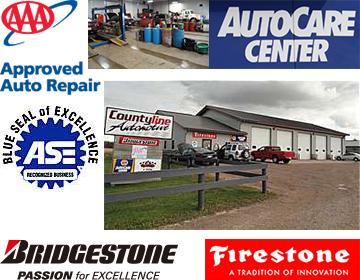 Countyline Automotive prides themselves on being a AAA auto approved business. We offer numerous auto repair services to help you get to where you need to go. 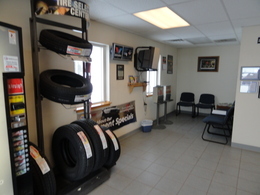 While waiting for your car, van, truck, SUV, crossover, or Motorhome to be fixed, you may relax in our lobby watching television, reading a newspaper, magazine, or working on projects with your laptop computer. Our staff consists of trained and ASE Certified Technicians with many years of experience. We are At Your Service, Even Away From Home with Nationwide Warranty (24 Months - 24,000 Miles) Plans. Last but not least Countyline Automotive also provides customers a 24 Hour Towing Facility. 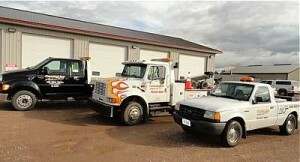 Three Trucks for any of your needs.